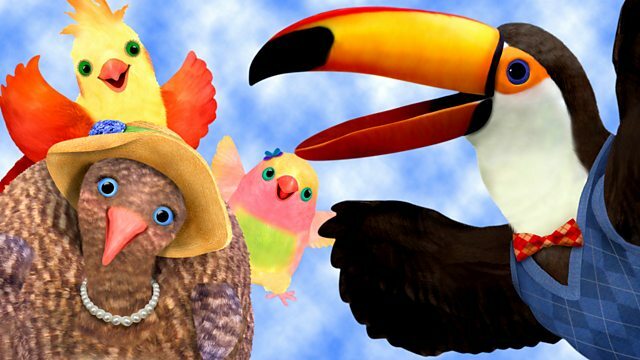 Colourful adventures of a group of birds who help children grow up. Samuel and Muffin ask Mrs Lovebird to fly them to the super slide, but she is too busy. Browse content similar to Super Slide. Check below for episodes and series from the same categories and more! Want to help me pull up some weeds? -Wow! A new super slide at the park! Mum, can you take us to the super slide at the park? but I have to help Mrs Billingsley in her garden. We'll go some other time. We can make our own slide. Well, are we having fun yet? Samuel, Muffin wants SUPER slide. Did somebody say "super slide"? Rudy, do you know about the super slide? Been there! Slid down that. Muffin really wants a slide so I made her this one. Slide - yes. Super - no. But I can help you build a really super slide. Muffin, will you do the honours? Sorry, Muffin. I really thought it would work. I guess we won't be sliding today after all. What?! But you've built such a lovely slide. # What's the good in giving up? # What's to gain by calling quits? # For what's the good in giving up? You're right, Mrs Billingsley. We won't give up. Yeah. We'll keep on trying until we...whoa! I said, we'll keep on trying until we...whoa! If we put water on the slide, that'll make it slippery. Then it'll really be a super slide. Mrs Billingsley, can you spray water from your hose onto the slide? I would be honoured, Samuel. # The slide's all ready On your marks, get set, go! Colourful adventures of a group of birds who support children through the turmoil of growing up. Samuel and Muffin ask Mrs Lovebird to fly them to the super slide, but she is too busy. The children are disappointed but then get the idea to build a super slide of their own. They need to ask the neighbours for help.